Whether an amateur or professional, it pays to know what the 10 best camera back packs are. A time will come when you will have to carry your camera with you and probably for long distances. However, we all know that moving with the camera has its fair share of risks. First, there is possibility of sensitive items getting damaged due to movement, friction, shock and vibration. Second, it’s also possible to lose some items when packing or unpacking. Third, you may spend too much time and effort trying to find a part because of disorganization. The best way to avoid the above issues is investing in the best camera backpack. 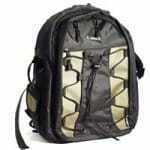 Material: The best back packs are made from sturdy materials that can resistant tear, wear as well as the elements. Materials such as ballistic nylon are popular because of their strength and resistance to water and moisture. Comfort: A good pack is comfortable to wear and doesn’t cause you to sweat too much. Good choices include cotton, polyester and poly-cotton. It will also feature wide shoulder straps which minimize aches and fatigue. Protection: Always go for bags that are heavily-padded as they absorb the shock, vibrations and will protect the camera and its accessories in case they fall or are bumped by other objects. Capacity: It’s advisable to pick a bag that is just right for the kind of camera. A small one means you have to squeeze the accessories and risk damaging some while a large bag makes the stored items knock against each other. Carrying the camera with lens and related accessories such as cables and chargers is much easier with this professional backpack. It’s made from strong and waterproof nylon, features quality Velcro enclosures and sturdy zippers. The soft and cushioned interior absorbs the vibrations and shocks while the customizable dividers make arranging items easy. Also worth mentioning is the customizable strap and back support that boost comfort. The bag is however not very big. 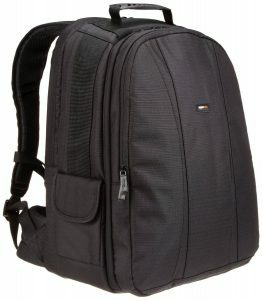 Professionals looking for large backpack to store their DSLR camera, 15.6-inch or less laptops, lens and up to 6 additional accessories will appreciate the Evecase backpack. 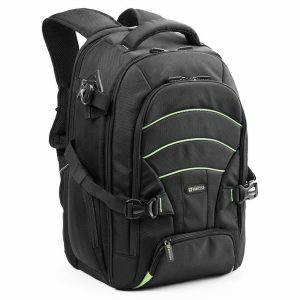 It features a large compartment for camera and laptop and zippered side pockets. For improved comfort and handling, the bag comes with a heavy-duty handle and shoulder straps. It could have been a better bag if the zippers were much stronger. 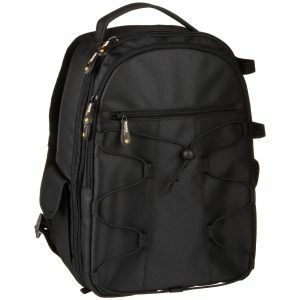 Protect your DSLR camera with this elegant and sturdy professional backpack from Acuvar. 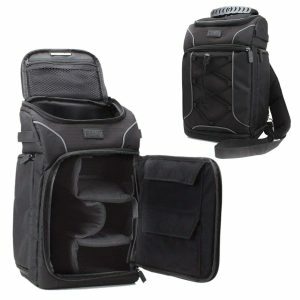 Made from durable nylon and polyester, this bag can hold 2 DLSR cameras, up to 4 lenses, 2 small camcorders and other accessories. It features thick foam that absorbs the shocks and vibrations hence protecting the stored accessories while the rain cover keeps water and rain at bay. The zippers however are not very strong. Storing your DSLR camera with lens, cables, chargers, manuals, clothes, snacks, water bottles and other accessories doesn’t need to be a complex and strenuous exercise. With the Koolertron canvas backpack, you are not only assured of good storage but also ultimate protection. 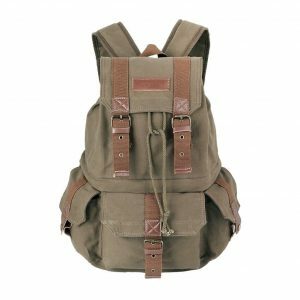 The bag is made from strong and heavy-duty canvas that is resistant to tear, wear and the elements while the padded lining protects the camera, lens, and other items. The only issue with this bag is the shallow top pocket. 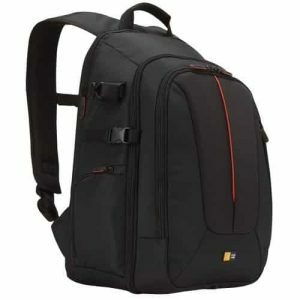 Safely and conveniently carrying your SLR Camera is more guaranteed with the Case Logic DCB-309 SLR back pack. It comes in a heavily-padded design and features compartment for a camera with lens, laptop, and other non-camera accessories. The easily accessible pockets plus the adjustable dividers make removal and storage easy. Unfortunately, the water-resistant bag comes with a rather soft bottom. The professionals-styled Flipside 300 backpack by Lowepro is ideal for amateurs as well as professionals. The compact and light bag features a back entry compartment, mesh side pockets, and outer storage panels. It can hold a camera with lens, camera gear, chargers, water bottles, cables, and other accessories. To improve comfort and stability, this bag features an adjustable sternum and detachable waist belt. A notable con is the location of the slip lock mounting straps which is not the best. 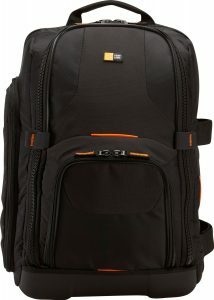 Moving with your DSLR camera, laptop and other accessories is much easier and convenient with the AmazonBasics backpack. This heavy-duty bag is made from sturdy materials that can resist tear and wear and tolerate bulky accessories. Courtesy of its customizable padded interior, the bag is fit for 2 SLR camera bodies, a 17-inch laptop, up to 4 lenses and other small accessories. People with few items may find the bag to be a bit bulky. 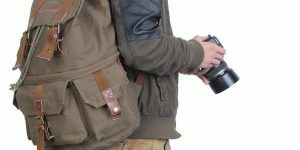 The SLRC-206 SLR backpack from Case Logic is designed to carry an SLR camera plus its lens, laptops measuring up to 15.4 inches and other accessories. The padded compartments keep the laptop and camera safe while the patent- pending hammock stores the additional accessories. It is resistant to water and rain courtesy of the water-proof EVA base. Unfortunately, the zippers at the top compartment tend to unzip when the bag is heavily-laden. The 200EG Photo backpack is designed for SLR cameras and is heavily-padded for ultimate protection. 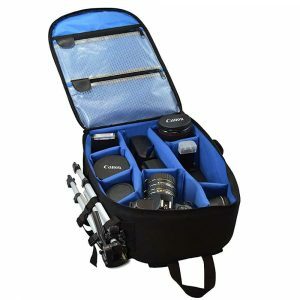 The high-quality bag features many compartments that can hold up to 2 small SLR cameras, 3-4 lenses and several other accessories. For best stability and safety, the bag also comes with external straps that are easy to adjust while the padded shoulder straps give the user more comfort. Unfortunately, the backpack generally is a bit soft. 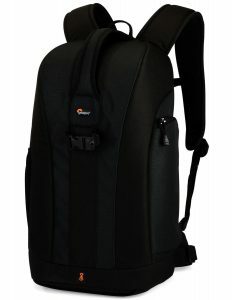 Made from high-grade and durable polyester and nylon, this backpack from AmazonBasics is ideal for both SLR and DSLR cameras as well as other accessories. It comes with spacious backpack support, well-lined compartments for the delicate accessories, two clear zippered plastic pockets and removable foam dividers. The canvas straps guarantee you of full security even when carrying heavy/bulky items. Some users nevertheless criticize the bag because of its shallow depth. The camera is pricey equipment that needs to be well protected especially when travelling with it. It may be damaged by the shocks, vibration, and accidental falls or may be bumped against other objects. You also desire to find the different items easily and conveniently without unpacking the entire bag. A good product will not only protect your camera but is also strong, durable and comfortable. Say goodbye to the inconvenience, excessive sweating or risk of damaging your camera by selecting any of the 10 best camera back packs that feature in the above review.